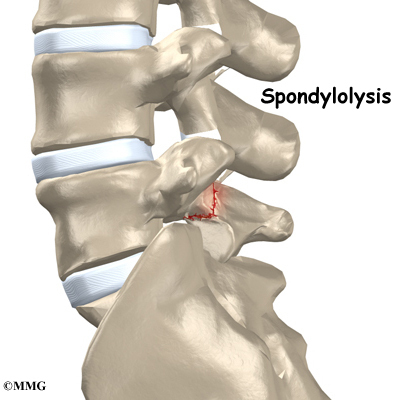 Spondylolysis happens when a crack forms in the bony ring on the back of the spinal column. Most commonly, this occurs in the low back. In this condition, the bone that protects the spinal cord fractures as a result of excessive or repeated strain. The area affected is called the pars interarticularis, so doctors sometimes refer to this condition as apars defect. This condition appears in six percent of children. It mainly affects young athletes who participate in sports in which the spine is repeatedly bent backwards, such as gymnastics, football, and karate. Although spondylolysis can affect people of any age, children and adolescents are most susceptible. This is because their spines are still developing, and the pars is the weakest part of the vertebra. Placing extra strain on this area of the spine during childhood increases the chance that a pars defect will occur. The human spine is made up of 24 spinal bones, called vertebrae. Vertebrae are stacked on top of one another to create the spinal column. The spinal column gives the body its form. It is the body's main upright support. The section of spine in the lower back is called thelumbar spine. Each vertebra is formed by a round block of bone, called a vertebral body. A circle of bone attaches to the back of the vertebra. When the vertebrae are stacked on top of each other, these bony rings create a hollow tube. This tube, called the spinal canal, surrounds the spinal cord as it passes through the spine. Just as the skull protects the brain, the bones of the spinal column protect the spinal cord. The protective ring that surrounds the spinal cord is a continuous ring of bone. Its sections include two pedicles, which attach directly to the back of the vertebral body. Two laminaecomplete the ring. The pedicles and laminae are two different areas of the bony ring. The area between them is not a joint. Rather, it is a location in the continuous ring of bone that doctors call the pars interarticularis, or pars for short. There are two such meeting points on the back of each vertebra, one on the left and one on the right. The pars is thought to be the weakest part of the bony ring. Spondylolysis is thought to be caused by repeated strains that damage the lower spine over time. The repeated strains can eventually lead to an overuse injury in the pars interarticularis. The most common location for this to occur is in the lowest vertebra of the spine, which doctors call L5. This vertebra connects the spine to the pelvis. However, a problem with the pars can occur in any lumbar vertebra. It rarely happens in more than one vertebra at a time. The vertebra initially responds to the abnormal strain by adding new bone cells around the injured area. But if the injuries happen faster than the body can keep up with needed repairs, a crack may form in the weakened bone. This is called a stress fracture. This type of fracture occurs in the pars, the area of bony ring between the pedicle and lamina. The crack may affect only one side of the bony ring. However, it is equally common for the defect to occur on both sides. When this happens, the vertebra is no longer held firmly in place by the facet joints on the back of the ring. As a result, the vertebra is free to slip forward over the one below. This slippage, which is closely related to spondylolysis, is called spondylolisthesis. Spondylolysis commonly occurs in young gymnasts who regularly practice backbends as part of their routines. Football linemen and dancers are also prone to spondylolysis. Symptoms sometimes appear when an athlete quickly ramps up his or her training intensity, applies incorrect technique, or uses poor equipment. People with spondylolysis may feel pain and stiffness in the center of the low back. Bending fully backward increases pain. Symptoms typically get worse with activity and go away with rest. Doctors refer to this type of back pain as mechanical pain because it most likely comes from excess movement between the vertebrae. Individuals may eventually experience pain that radiates down one or both legs. This pain may come from pressure and irritation on the nerves that exit the spinal canal near the fracture. When nerve pressure in the low back causes leg pain, doctors refer it asneurogenic pain. The cause of this nerve pressure is a result of the body's attempt to heal the stress fracture. Over time, the healing process may cause a bump of extra cartilage to grow at the site where the bones are trying to heal the overuse injury. If too much cartilage builds up, this bump may intrude into the opening where the nerves exit the spine. The bump may squeeze the nerve. This can produce pain and weakness in the leg. Reflexes become slowed. The person may also notice a pins and needles sensation in the skin where the spinal nerve travels. Diagnosis begins with a complete history and physical exam. Your doctor will ask questions about your symptoms and how the problem is affecting your daily activities. You will be asked about your involvement in sports and your level of performance. Doctors may suspect a problem with spondylolysis in football linemen, gymnasts, and those in similar sports that require intensive levels of performance. Your doctor will also want to know what positions or activities make your symptoms worse or better. Next the doctor examines you by checking your posture and the amount of movement in your low back. Your doctor checks to see which back movements cause pain or other symptoms. Your skin sensation, muscle strength, and reflexes are also tested. Your doctor may order an X-ray of your low back. An angled, or oblique, view is often used to check for a pars fracture. The doctor traces around the vertebral body and bony ring on the X-ray film. The outline normally forms an image that looks like a small dog. When a crack is present, however, the dog will appear to have a collar around its neck. This is referred to as the Scotty dog sign. It confirms a diagnosis of spondylolysis. Small defects in the bone may not show up on X-ray. Also, a recent stress fracture won't always appear on X-ray. As a result, your doctor may order a bone scan to get the most accurate information. This involves injecting chemical "tracers" into your blood stream. The tracers then show up on special spine X-rays. The tracers collect in areas of extra stress to bone tissue, such as a stress fracture of the pars interarticularis. Computed tomography (a CT scan) may be ordered. This is a detailed X-ray that lets doctors see slices of the body's tissue. The image can show if the edges of the fractured bone have begun growing together. The scan shows whether the fracture is new or old, so doctors can decide which treatments will help the most. When more information is needed, your doctor may order a magnetic resonance imaging(MRI) scan. The MRI machine uses magnetic waves rather than X-rays to show the soft tissues of the body. It can help in the diagnosis of spondylolysis. It can also provide information about the health of nearby intervertebral discs and other soft tissues that don't appear on X-rays. Doctors often begin by prescribing nonsurgical treatment for spondylolysis. This is because symptoms from these stress fractures often resolve with rest or bracing. In some cases, doctors simply monitor their patients' condition to see if symptoms improve. An X-ray may be taken every few months to check how well the area is healing. If the doctor feels that the problem is due to a recent fracture, you may be placed in a rigid back brace or cast for three to four months. Keeping the spine from moving can help ease pain and inflammation. It can also improve the chances the bones will grow back together. Most people who require a brace or cast overcome symptoms and are able to eventually get back to activities free of pain. This can happen even when follow-up tests show that the bones haven't completely healed. Your doctor may ask that you rest your back by limiting your activities. The purpose of this is to help decrease inflammation and calm muscle spasm. You may need to take some time away from your sport, especially if it requires repeated back bending. This gives your back a chance to heal. Most patients who follow these measures get better. Patients are rarely counseled to completely discontinue participating in their sport, and only in severe cases. Patients often work with a physical therapist. After evaluating your condition, a therapist can assign positions and exercises to ease your symptoms. The therapist may design an exercise program to improve the strength and control of your back and abdominal muscles. By watching you perform your sport activity, your therapist can suggest style, technique, or equipment changes to improve your performance and prevent future problems. The way spondylolisthesis is treated will depend on your symptoms and how severe they are. In most cases non-surgical treatments will be recommended first. These measures will only provide temporary symptom relief, but your symptoms may disappear completely with time. Back braces sometimes used to be recommended for some people with spondylolisthesis. However, there are concerns that bracing may actually weaken the spine and fail to improve symptoms. Surgery may be recommended if non-surgical treatments are ineffective and your symptoms are severe, persistent, or suggest you have a compressed nerve in your spine. The exact surgical procedure you need will depend on the type of spondylolisthesis you have. It usually involves fusing the slipped vertebra to the neighbouring vertebrae using metal screws and rods, and a piece of your own bone taken from an area nearby. The screws and rods are usually left in place permanently. In some cases the spinal disc being compressed between your vertebrae may also be removed. It will be replaced by a small "cage" containing a bone graft to hold your vertebrae apart. The operation is performed under general anaesthetic, which means you'll be unconscious while it's carried out. Surgery is often effective at relieving many of the symptoms of spondylolisthesis, particularly pain and numbness in the legs. However, it's a major operation that involves up to a week-long stay in hospital and a recovery period lasting months, where you have to limit your activities. Nerve compression can cause considerable pain and symptoms. If too much cartilage builds up where the fractured bones are trying to heal, the nerve that passes near the injured bone may get squeezed, as described earlier. To fix this, a section of the bony ring is removed to take pressure off the nerve. The procedure to remove the lamina from the bony ring and release pressure on the nerve is called laminectomy. A spinal fusion may be required after a surgeon performs a laminectomy procedure. Fusion is recommended when a spinal segment (a set of vertebrae) has become too loose or unstable. A spinal fusion allows two or more bones to grow together, or fuse, into one solid bone. This keeps the bones and joints from moving. In this procedure, the surgeon lays small grafts of bone over the problem area on the back of the spine. Some surgeons also apply metal plates and screws to prevent the two vertebrae from moving. However, this practice is controversial because fusion occurs in about 90 percent of children with spondylolysis when the procedure is done without plates and screws. Recovery from this condition is much like nonsurgical treatment mentioned earlier. Once you have rested your back to allow it to heal, your doctor may recommend that you work with a physical therapist a few times each week for four to six weeks. In severe cases, patients may need a few additional weeks of physical therapy. The first goal of treatment is to control symptoms. The therapist works with you to find positions and movements that ease pain. Treatments of heat, cold, ultrasound, and electrical stimulation may be used to calm pain and muscle spasm. As you recover, you will gradually advance in a series of strengthening exercises for the abdominal and low back muscles. Working these core muscles helps patients begin moving easier and lessens the chances of future pain and problems. When needed, a therapist can work closely with a sports coach on strategies for a patient's safe return to his or her sport. The two may provide suggestions on technique, equipment, and training frequency and intensity. If the patient is a working adult, the therapist may also work with the patient's doctor and employer to help the patient get back on the job as quickly as reasonably possible. The patient may be required to do lighter duties at first. As soon as the patient is able, he or she will do normal work activities. The therapist may also suggest changes that could help the patient work safely, with less chance of re-injuring his or her back. A primary purpose of therapy is to help patients learn how to take care of their symptoms and prevent future problems. Patients are given a home program of exercises to continue improving flexibility, posture, endurance, and low back and abdominal strength. The therapist also describes strategies you can use if your symptoms flare up. Most adolescents get better after wearing a brace or cast for three months. Even then, a CT scan sometimes shows an unhealed fracture. In these cases, however, symptoms often go away completely, allowing a safe return to sports. Patients do best when guided in a gradual manner with the supervision of a therapist and sports coach. Rehabilitation after surgery is more complex. Some patients leave the hospital shortly after surgery. However, some surgeries require patients to stay in the hospital for a few days. Patients who stay in the hospital may visit with a physical therapist in the hospital room soon after surgery. The treatment sessions help patients learn to move and do routine activities without putting extra strain on the back. Many surgical patients need physical therapy outside of the hospital. Patients who've had lumbar fusion surgery normally need to wait at least six weeks before beginning a rehabilitation program. This delay gives the fusion a chance to start healing. Patients typically need to attend therapy sessions for six to eight weeks and should expect full recovery to take up to six months.